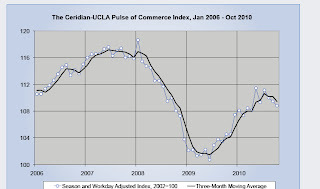 Here is another Leading Indicator in which tracks US Economy. 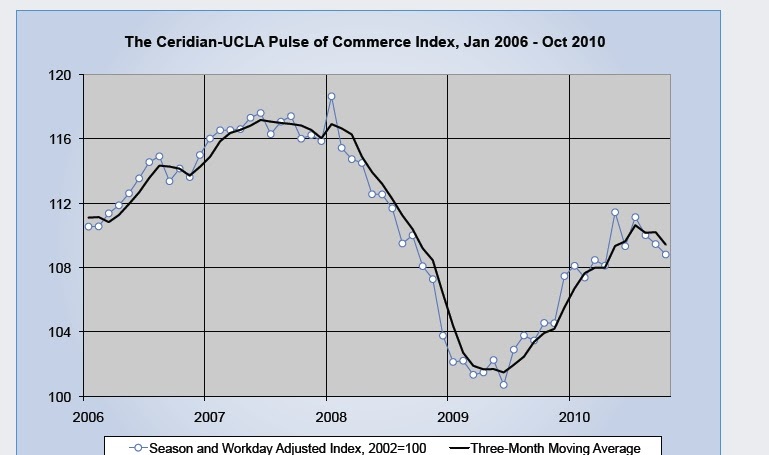 The Ceridian-UCLA Pulse of Commerce Index™ is based on real-time diesel fuel consumption data for over the road trucking and serves as an indicator of the state and possible future direction of the U.S. economy. By tracking the volume and location of fuel being purchased, the index closely monitors the over the road movement of raw materials, goods-in-process and finished goods to U.S. factories, retailers and consumers. October Month report signals economy is not going in right direction for now. Here is the October Report. October is especially important because it is the peak month for holiday shipping, with a seasonal factor of 1.029 compared with 0.978 in November and 0.941 for December. The October decline in the PCI can be summarized in a single word: worry. Worry about the strength of sales in the holiday period has apparently caused a slowdown in trucking in October which might be only a postponement to November if consumers show a little more exuberance. The PCI this month is disappointing because the growth in the economy in the first three quarters of this year if sustained would have made the holiday even better.The declines in the PCI in the last three months suggest further slowing of growth of industrial production. I agree its an indicator because to a fair extent the graph depicts the way economy has gone, but has there been a signal/trigger point at any time in this indicator which has reflected the future by any extent? Throw some light please, I tried analyzing, but I felt its not a fair leading indicator, if we see the dates clearly it shows that people have stopped diesel consumption after they things went wrong, not before, so its event driven, how could we possibly call this a leading indicator then?